Toronto, Ont. – The Canadian Hockey League today announced the week five edition of the Kia CHL Top-10 Rankings for the 2018-19 season. 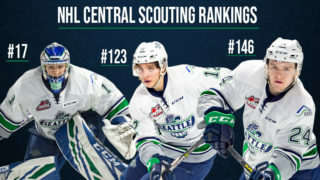 The weekly rankings of the CHL’s Top-10 teams are selected by a panel of National Hockey League scouts. On the strength of a week that featured three victories, the Prince Albert Raiders took over top spot in the Kia CHL Top 10 Rankings. Returning home from a road trip, the Raiders downed the visiting Red Deer Rebels 2-1 Saturday before venturing south to defeat the Saskatoon Blades by a 6-2 score Sunday. Tuesday night at the Art Hauser Centre, the Raiders doubled up the Calgary Hitmen by an 8-4 score. WHL scoring leader Brett Leason was named the WHL On the Run Player of the Week Monday while goaltender Ian Scott (Toronto Maple Leafs) earned WHL Eli Wilson Goaltending Goaltender of the Week honours for the second time this season. A perfect 5-0-0-0 at home, the Raiders will continue a three-game homestand when the Spokane Chiefs roll into town Saturday, October 20 (7:00 p.m. MT). The Victoria Royals held steady in spot four for the second-straight week after splitting a pair of tight one-goal contests on Vancouver Island against the Vancouver Giants. Saturday, the Royals earned a 3-2 overtime victory before falling by a 3-2 score in regulation a day later. The good news continued to roll in for the Royals Wednesday as defenceman Scott Walford (Montreal Canadiens) was named to the roster for Team WHL that will compete at the 2018 CIBC Canada Russia Series. In the middle of a six-game homestand, the Royals will play host to the Swift Current Broncos Wednesday, October 17 (7:05 p.m. PT). Moving up a single spot this week were the Vancouver Giants, who now occupy the sixth spot in this week’s Kia CHL Top 10 Rankings with a 9-1-1-0 record. The Giants split their aforementioned pair of games against the Royals on Vancouver Island before returning home to down the Broncos by a 6-2 score Tuesday. A pair of Giants in goaltender David Tendeck (Arizona Coyotes) and 2019 NHL Draft prospect Bowen Byram were named to Team WHL’s roster for the 2018 CIBC Canada Russia Series Wednesday. 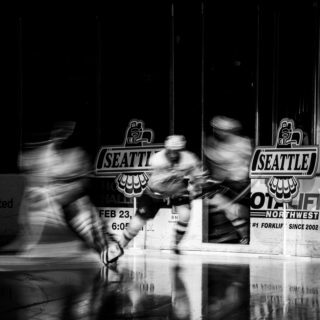 Up next for the Giants is a date south of the border with the Portland Winterhawks on Friday, October 19 (7:00 p.m. PT). 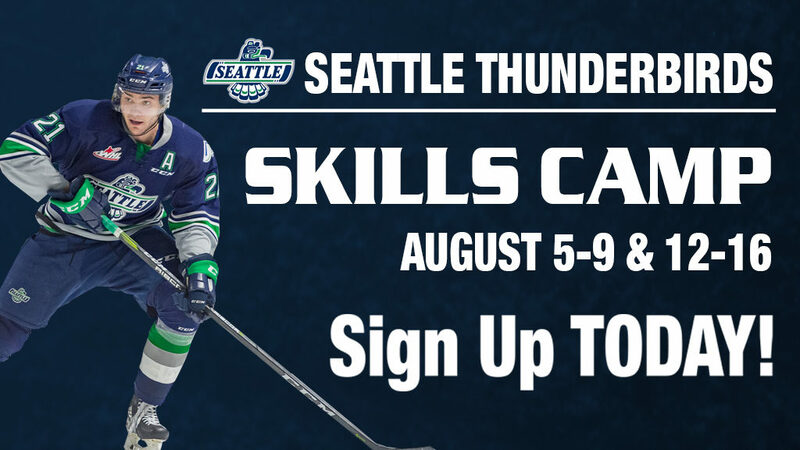 Earning an honourable mention this week were the Seattle Thunderbirds, who took over top spot in the U.S. Division Tuesday with a 5-4 win against the Tri-City Americans. 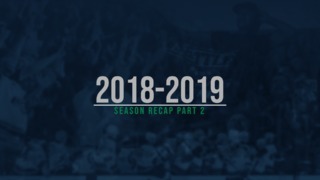 The Thunderbirds’ week also featured a wild 9-6 win against the Kelowna Rockets and a 7-3 victory against the Edmonton Oil Kings. Captain Nolan Volcan paced the Thunderbirds with a pair of goals and four points in Tuesday’s win, notching the game-winning goal. Through eight games though, it’s 2019 NHL Draft prospect Dillon Hamaliuk leading the team with 15 points (6G-9A). 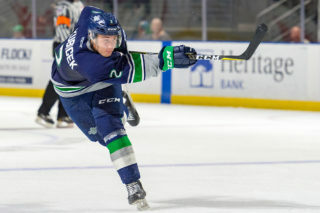 The Thunderbirds are back in action Friday, October 19 (7:05 p.m. PT) when they take on the Americans in Kennewick, Wash. to complete a home-and-home series.